Everyone loves jumping. Everyone in my family loves jumping anyway. 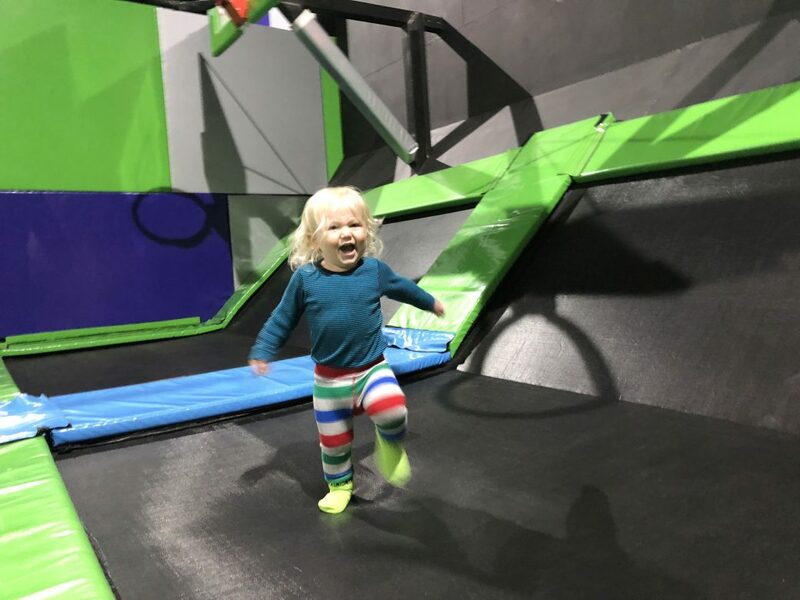 So when we were invited along to check out the Mini Flippers parent and pre-schooler session at Flip Out, we jumped at the chance. (Don’t worry, that’s the only pun I’m doing today.) And we had so much fun that we’ve been a couple of times now, so this review is based on all of the times we’ve been. 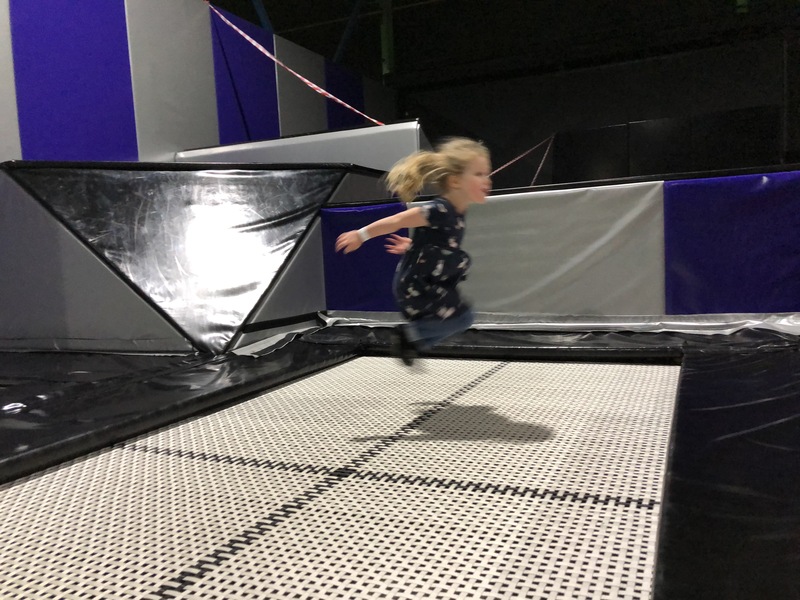 In the other trampoline places we’ve tried, kids are only allowed in at certain times and you’re not allowed to jump with them. But in Flip Out kids can go at any age at any time. And it is brilliant! The thing I liked most about these sessions is that you don’t need to book a time in advance. I just know that if I did the little man would fall asleep or something and I’d end up missing it. If the kids get hungry you can also leave the arena and go up to the cafe for lunch and then come back down again. 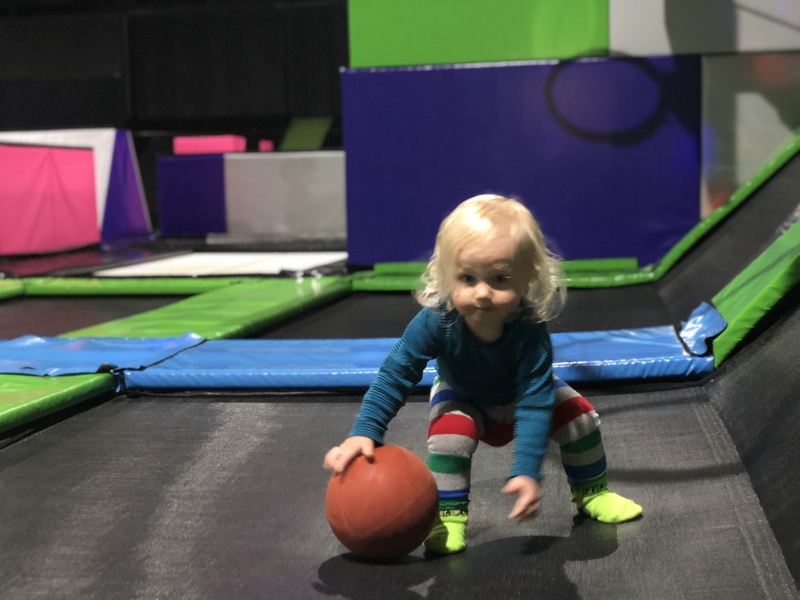 These sessions give you the freedom you need with little kids who, when they decide they’re hungry, will not wait patiently until the end of your trampoline session before they enter hangry meltdown mode. Flip Out Glasgow is huge, and it has so much packed into it. There’s a young kids area with at least 12 trampolines that are only for little kids to jump on. 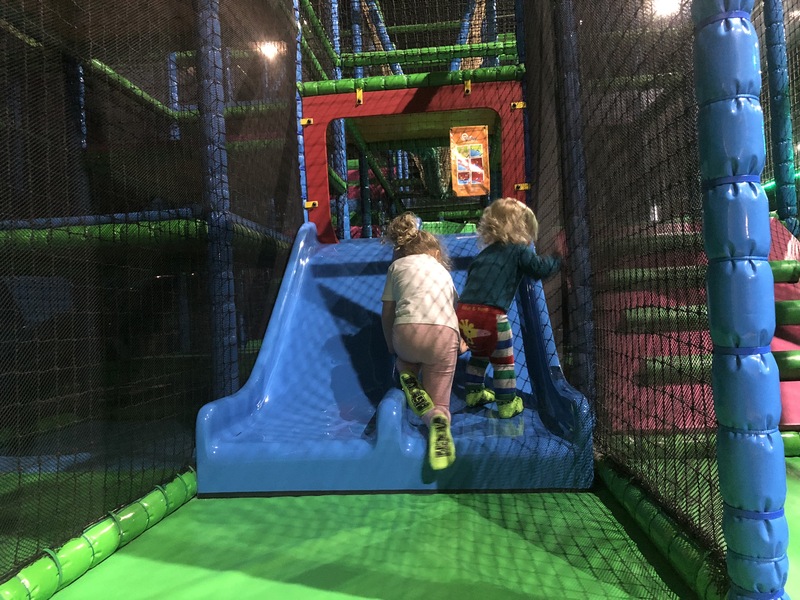 (Their adults aren’t allowed to jump on these at all – daddy got into trouble for that!) Through in the hall next door there are bigger trampolines for anyone to jump on. There are a couple of parkour areas. One is smaller so I assume it’s for younger kids (or beginners) and one is much bigger, in the main trampoline arena. The little lady loved this bit. 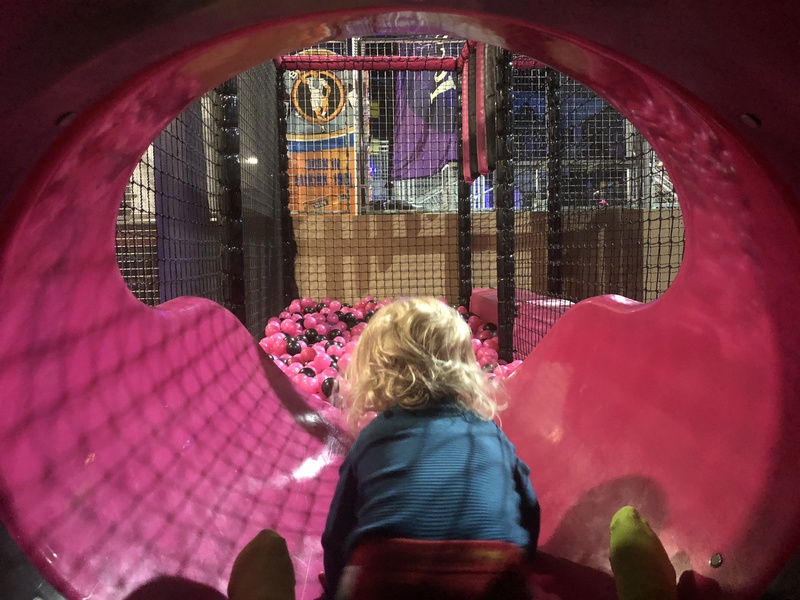 She loves nothing more than climbing up stuff, so being able to climb up and jump between things without hitting hard ground beneath was brilliant for her. The little man is partial to a ball. And I mean a ball of any kind that he can run around with and throw. Backwards mostly, over his own head. 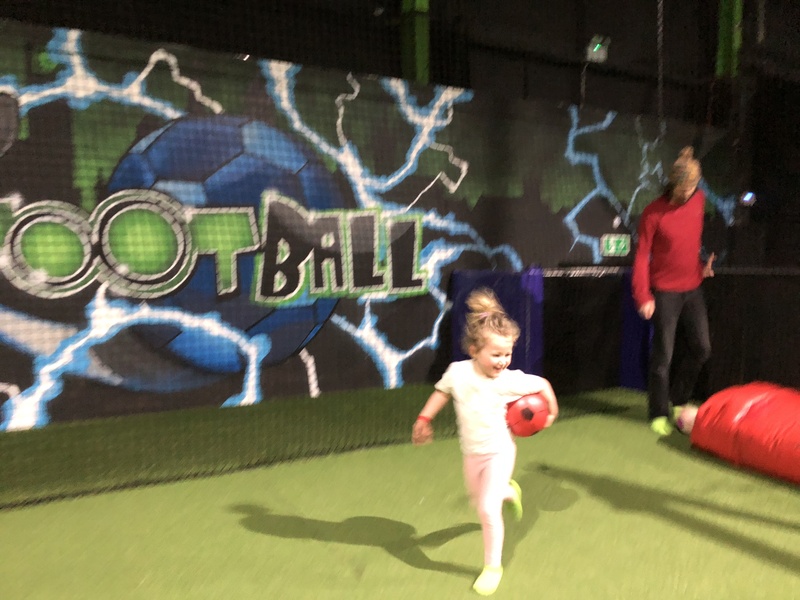 So naturally we spent quite a bit of time in the big football pitch (mostly getting in the way of slightly bigger kids who were trying to play an actual game of football – oops). The goals have big long trampolines in front of them so you can really test your goalie skills out! They also have foam pits to leap into. These can be so difficult to get yourself back out of though. I got stuck! 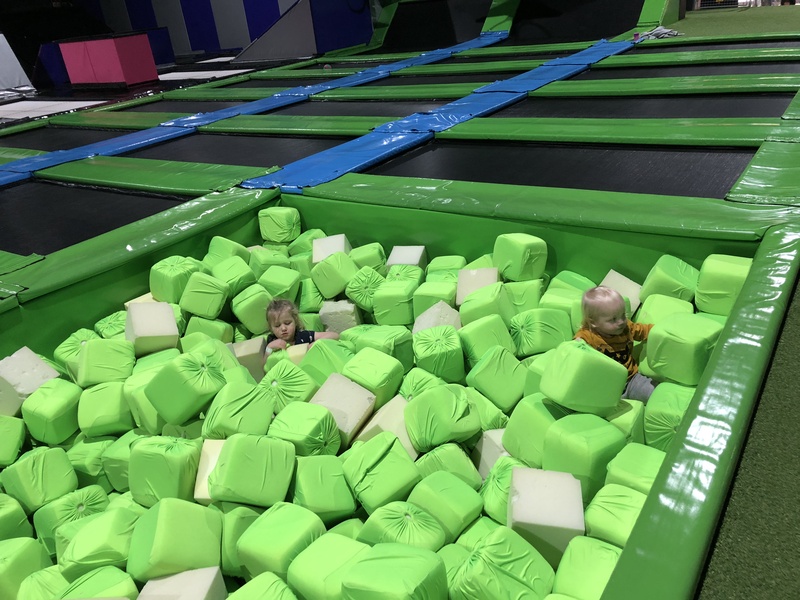 You can stand on a padded plank and use those gladiator stick things to fight someone with a foam pit beneath you. 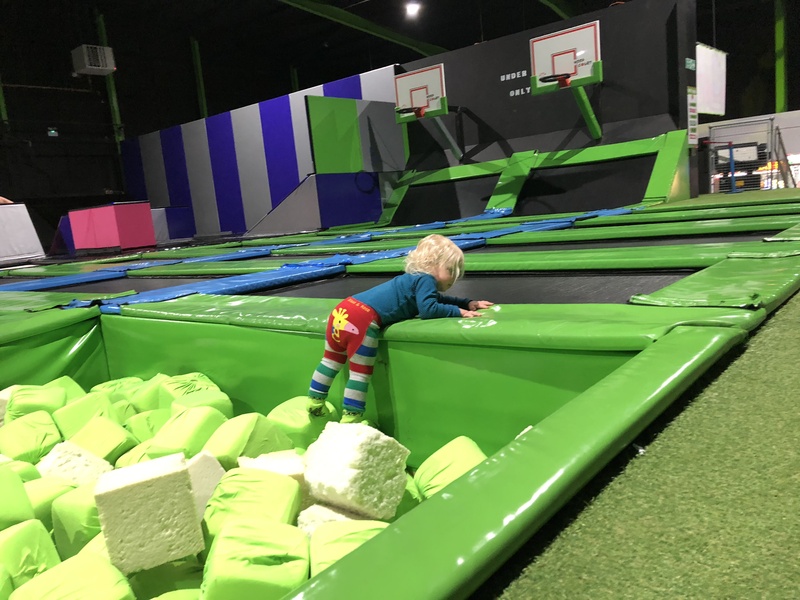 There are trampolines with obstacles, trampoline basketball, big long trampolines for practising flips or tricks of some sort (another favourite of the little man – he loved running up and down these), a ninja warrior course which their daddy and I had a shot of, and an area for dodgeball trampolining. I’ve probably missed a few things, but these are the ones I remember. In the main arena there’s also a big twisty tunnel slide with a ball pit at the bottom. Big hit with my two. We didn’t manage to get to the cafe either time we’ve been. But it’s there and it serves up some hot meals, sandwiches, snacks, and hot and cold drinks. That’s the extent of my knowledge so I can’t comment on it yet. 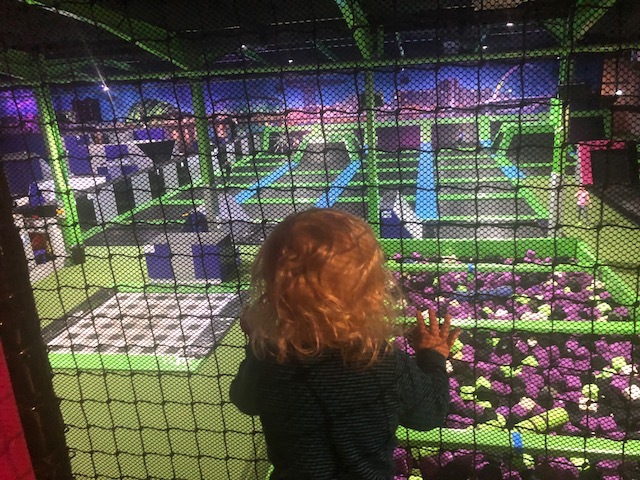 Little kids can use all of the equipment except the ninja warrior courses. I took the two of them by myself once. I think that two young kids per adult is maybe the limit so I’d check that if you’re planning on turning up with 4 under 5’s on your own. If you do book into a session I would try to turn up about 15 minutes early so that you can get registered and sorted out. You need to sit and watch a safety video every time you go. This takes just a few minutes but if there’s a queue they run it when the room gets a bit fuller, so you might need to wait 5 minutes or so before they start it and it could eat into your session time. 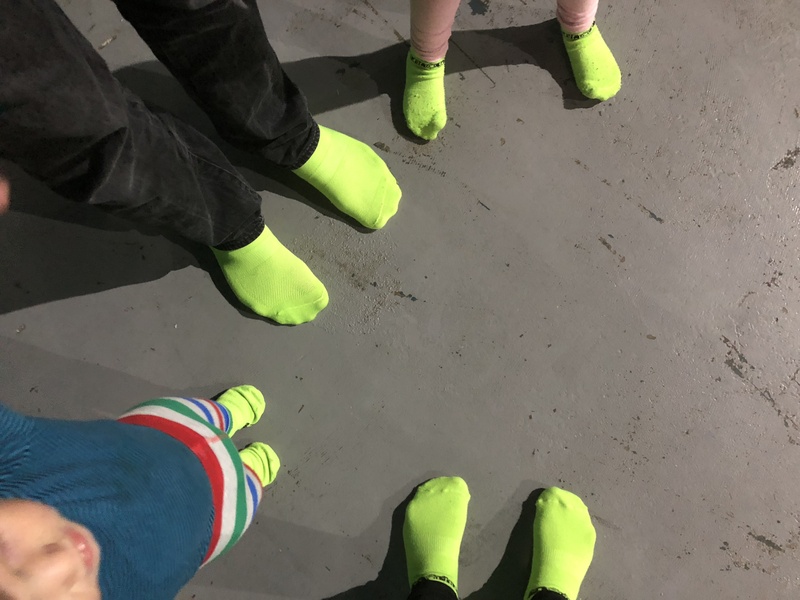 You need trampoline socks for everyone who’s participating. You’ll only need to buy them once though, because once they’re worn, they’re yours. My one and only gripe with Flip Out has absolutely nothing to do with the trampolining: it’s the number of machines around the locker area. 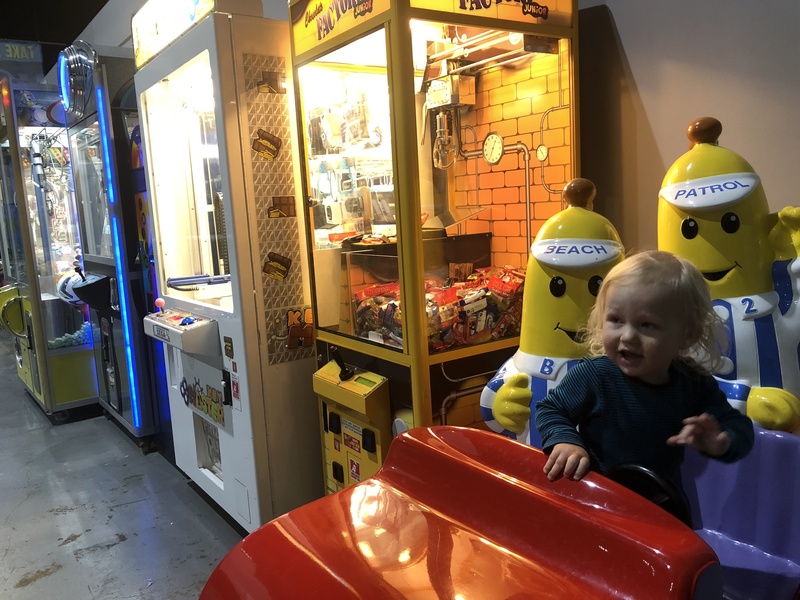 There are SO many of them and I have one kid who just wants to sit in the ride-on things having meltdowns when I remove him from them, and one kid pleading for a pound so she can press a button to get a plastic ball with about 2 jelly babies or something in it. To which I always say no and then (stupidly) feel guilty and I DON’T NEED EXTRA GUILT. Honestly, those things do my head in. For the pre-schooler Mini Flipper sessions the cost is £4 for kids and £4 for their accompanying adult. You pay for the hour and can play for as long as you like between 10am and 4pm. You also need to buy some trampoline socks for everyone. These cost £2 per pair. The kids had an absolute blast and we were all exhausted by the end. At £4 per person for almost unlimited time it’s great value too. 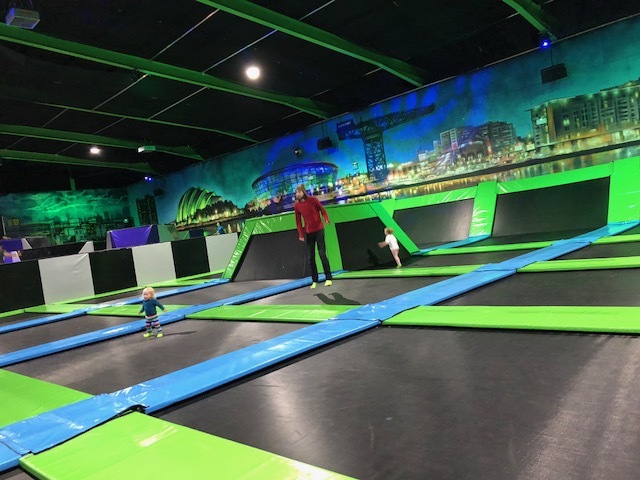 Flip Out is definitely our favourite trampoline place in Glasgow so far! Flip Out trampoline park is located at 89a Southcroft road, Rutherglen, Scotland, G73 1UG. OUR TICKETS FOR OUR FIRST TRAMPOLINE SESSION WERE VERY KINDLY GIFTED TO US BY THE NICE FOLKS AT FLIP OUT. HOWEVER ALL OPINIONS, WORDING AND PHOTOGRAPHY IN THIS ARTICLE ARE MY OWN.